Welcome to Today Bread! We are a small organic sourdough bakery and cafe located in Walthamstow Central. We believe in local, seasonal and sustainable food. Each of our loaves are expertly made by hand using organic flour and the slow fermentation process that characterises sourdough bread. Our bread is stone baked and delivered by bike to local cafés, delis and restaurants in the neighbourhood. You can also pop by the Today Bread café in the heart of Walthamstow to enjoy it with brunch or on our delicious range of sandwiches and toasties. Our bread is freshly made every morning in front of you using organic flour, water, salt, and most importantly, time! Rather than using commercial yeast, our loaves are made using naturally occurring yeast giving them the beautiful flavours and aromas that make sourdough bread so special. We aim to make all our cakes and pastries on site in the bakery. To keep things fresh and exciting, we offer seasonal variations, using organic and local ingredients as much as we can. Reducing waste and creating original recipes is important to us, so you may recognise some of the ingredients used in our breads and in our kitchen in our beautiful range of cakes and pastries. Part of Central Parade - the creative hub run by Meanwhile Space - our light and airy café welcomes a mixed crowd of both locals and London explorers from all walks of life. Our busy bakery and cafe is surrounded by a variety of independent retailers, studios and co-working areas. Located in a historic post-war building that previously hosted a bank and council offices, our café was designed by acclaimed architects Gort Scott. We are available for exclusive hire to host events, parties, or to use as a filming location. Please email us for more details. We are proud to be working with a small selection of hand picked producers we strongly believe in. Our coffee is roasted by the fantastic Mozzo Coffee team who strongly invest in ethical farming through their Community2Ccommunity fund, which was co-created to help the farmers back in the Democratic Republic of Congo. And WOW, do their coffees taste amazing! The milk used for our coffees and cakes comes straight from The Estate Dairy, a small team of dairy merchants specialised in producing high quality un-homogenised milk in the Chew Valley, Somerset. Their farm is run on a free range system, exposing all 250 pedigree Guernsey cows to as much fresh pasture as possible throughout the summer months. This results in a happier and healthier herd yielding a rich golden milk, particularly suited to create premium coffee drinks. Our ever-so popular cheese toasties are made exclusively with English sourced cheeses. With this focus in mind, we chose Buchanan's, an artisan cheesemonger located in Mayfair, Central London. The organic flour used for our breads and cakes come from Shipton Mill based in a Cotswold valley near Tetbury, specialised in milling a range of organic flour of exceptional quality. Other providers include Birchall teas, James White fruit juices, Karma Cola soft drinks, Bee17 Honey, Ella’s Kitchen, Snact and Urban Fruit. Alex started his venture in 2006 with The Bread Workshops while at the Royal College of Art. A perfect tool for exchange, conviviality, education and great meals, Bread sums up our strong ethos centred on healthy food, friendship and beautiful design. Making sourdough breads from home while learning the craft in local bakeries, Alex's started doing deliveries of his sourdough breads by bike to a small but growing group of local friends, cafés and Bread Club members. Soon forced to transform a room of his flat into a mini bakery (with 25kg bags of flour everywhere, fridges stacked on top of each others, flour everywhere, very little sleep and a very very understanding partner), it slowly became obvious we had to move into the real world and it was time to open a bakery! This happened in 2016 when Today Bread opened its door in Walthamstow Central on a Monday morning, purveying organic breads and great coffees to the local community while retaining the bike deliveries. With international recognition for his work in design, graphics, events, curating and education, DesignMarketo’s co-founder combines his large experience to produce one of the most simple foods today: bread. The smaller sister of the Table Loaf, the Round Table is exactly the same dough but in a slightly smaller version. Ingredients: Rye starter, Organic wholemeal and light wheat, Water, Salt. Nothing else. 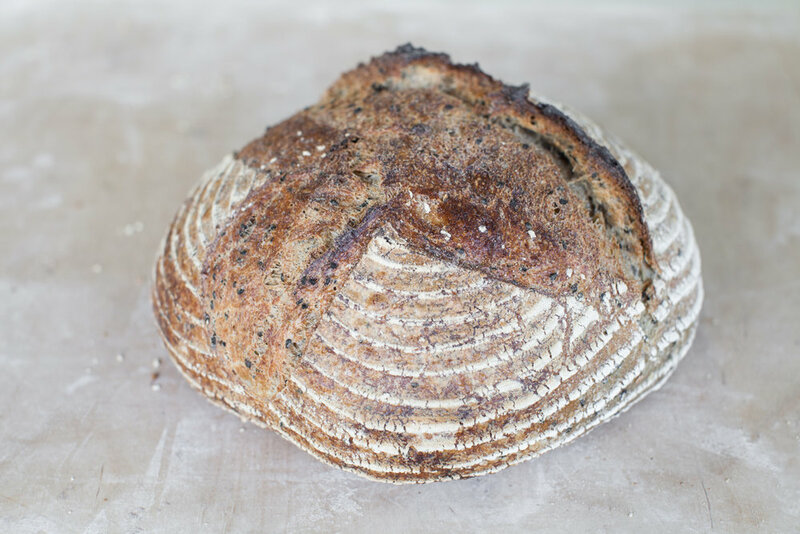 Our Table Loaf is a 1kg Sourdough bread made with 20% wholemeal organic flour and our Rye Starter. Ingredients: organic wholemeal and light Wheat, wholemeal Rye, cracked Rye, English grown golden and brown linseeds, English grown Quinoa, Oats, Cracked Rye, Salt, Water. The classes usually run on Sunday afternoons in our bakery from 4:30pm > 8pm. The price includes for a tote bag to carry your breads and starter home, all the recipes used in the class (plus more! ), and a little booklet with reading suggestions plus explanations and notes from the class! We offer some light refreshment (tasty bread!) during the class and a drink on arrival! We also offer Bread Class Gift Certificates as a perfect present for your friends and family! You can buy one in the drop down menu Select Date (> select Voucher) or we can tailor a class for larger groups / corporate events. Please get in touch! Designed specially for home baker, our Bread Classes are an introduction to sourdough bread making. With our first class you will learn how to make two Sourdough breads from mixing to baking and get to go home with your own freshly baked breads, together with the recipes and enough sourdough Starter to make your own loaf at home (forever!). Cancellation policy: We appreciate that there will be circumstances whereby you will need to cancel your booking or change the date. Please note that bookings cancelled more than 14 days prior to the start of a course will be refunded, or you may transfer to another date free of charge. Bookings cancelled within 14 days of the start of a course are non-refundable and non-transferable, the only exception being if we are able to refill your place. If we are able to do so a full refund will be given, or you may transfer to another date available. We did the workshop few weeks ago and it was fantastic. During the 3-4 hours, we learned about the whole process, types of bread, ingredients and few tricks (that I will keep for myself...). Alex was very friendly and answered all our questions with clear and precise information. By the end of the workshop, we took our breads home and it was delicious! 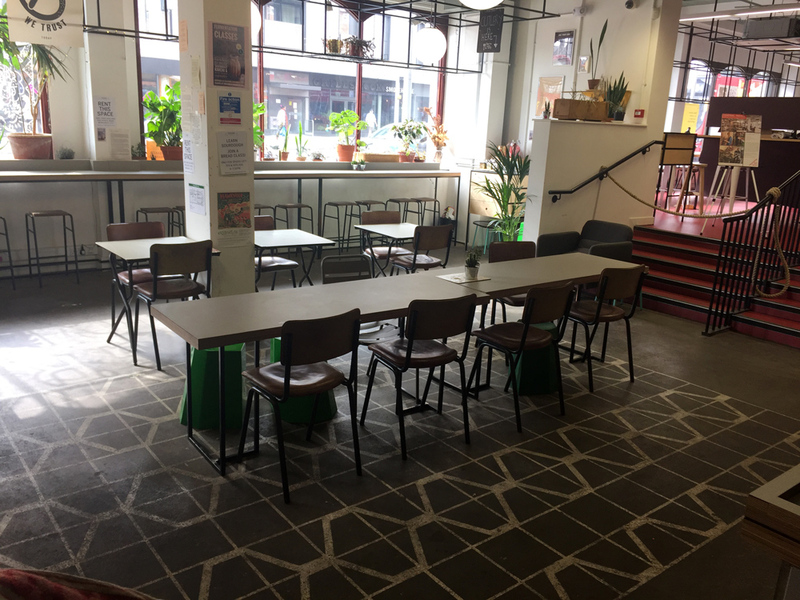 Our large cafe seating area is available to rent for private events, workshops, talks, seminars, exhibitions, etc. Access: we are about 1 min from Walthamstow Central (Tube + Overground) and Walthamstow main bus station. To check availability, timing, rates, etc and to tell us more about your event please fill in this form. Looking forward to have you in our space! The Today Bread cafe seating area bathing in light. We partnered with our local milkman Parker Dairies, who delivers our breads to your home during the quiet hours of the night. To receive your loaf right on your doorstep, please visit their website and order directly through them! The Hornbeam Cafe (Walthamstow), OrganicLea (Walthamstow & Leytonstone markets), Salut! Restaurant (Highbury), Curved Brick (Leyton), Trangallan (Stoke Newington), Bake Street (Stoke Newington), Black Cat (Hackney), Denim'n'Dine (Walthamstow), Coffee Boxx (Wood Street), Yardarm (Leyton), Perky Blenders (The Magistrates), etc..